Social Shopper, a deal-of-the-day website, gains wide exposure through a creatively envisioned and designed trailer by Global Creative Studios. Tarzana, CA, Los Angeles, CA—Social Shopper is a deal-of-the-day website that offers a daily deal at a discount of 50%-90% off of prices from the best local spas, bars and nightclubs, theatres, outdoor activities and recreation, health and fitness, cultural arts and entertainment, restaurants, retail products, and more. Established in 2010 in Vancouver, Social Shopper has become a main competitor of LivingSocial and Groupon. Because of its recent start-up and small business-like feel, Social Shopper is able to personably meet clients’ consumer needs. Social Shopper flourishes with its mission of collective consumer power designated as “social shopping,” which is the act of buying together and, as a result, saving money together. Social Shopper enables its clients to hold the much-needed consumer power in a rough economy. Global Creative Studios, a one-stop digital studio based in Los Angeles that provides services for all business development needs, has assisted Social Shopper in its business promotion. Global thrives on its ability to think creatively and effectively in order to personally represent and promote every client. Global’s creative think-tank consists of professionals with over 35 years of combined experience. Innovative CEO of Global Creative Studios, Pedram Doustkam, “Peter Doust,” envisioned a way in which Social Shopper could optimize its exposure as an expanding business. Global invested in a trailer that would promote Social Shopper and more widely reach the daily-deal company’s intended audience. 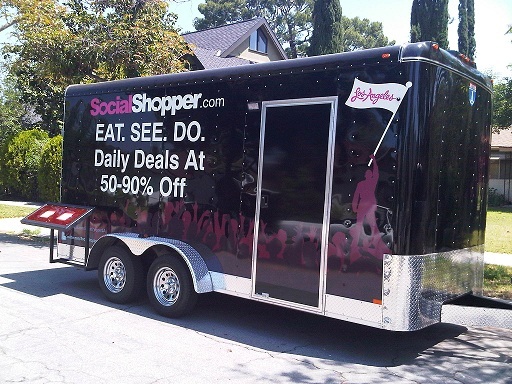 This trailer became a virtual manifestation of Social Shopper and traveled all around Los Angeles reaching out to customers. Once Peter Doust’s vision was made a reality, Global’s team of graphic designers and other professionals worked assiduously to create a design for the trailer, while Doust custom-made a removable contraption that would protrude from the outside of the trailer and be the resting place for two ipads. As seen in the picture, these ipads were used for passers-by to access and sign up for deals on Social Shopper’s website. Global Creative Studios also designed business promotion items, including bags, Chap Stick, hats, gift cards, t-shirts, sweatshirt hoodies, and more that were handed out at the trailer’s site. This eye-catching trailer inspired people to walk up and see what was happening, which caused Social Shopper to gain exposure and customers immediately. The crowd was excited and thrilled with the free promotional items, and the ipads engaged the crowd by providing a way for the people to actively participate in this business’ mission. It is creativity such as this that keeps Global Creative Studios ahead of its competitors and well-respected by its clients. Global Creative Studios also brought Social Shopper to the 2011 Sundance Film Festival and showcased Social Shopper with custom-designed promotional items, which provided business advertising and were worn by attendees and celebrities alike at the well-renowned film festival. This Los-Angeles based company was established in 2004 and is comprised of skilled experts with over 35 years of combined experience. Global is dedicated to providing the best service for red carpet events, in addition to the multitude of other services offered, including eco-friendly printing, web and graphic design, social media, mobile website design, and promotional items, among others in order to satisfy every business need.